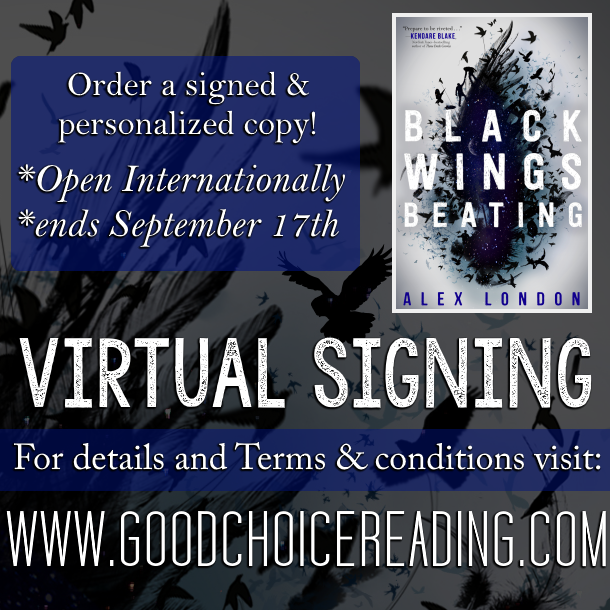 Good Choice Reading: Black Beating Wings by Alex London Virtual Signing! Black Beating Wings by Alex London Virtual Signing! Good Choice Reading has teamed up with Barnes & Noble in Oxford Valley, PA to bring you this special virtual signing! Author Alex London will be visiting their store to talk about his new book, BLACK WINGS BEATING on September 25th! All books will be signed on September 25th and shipped right after. Refunds will be honored until September 17th. After September 17th there are no refunds, as all books have been ordered via the bookstore. Good Choice Reading/Alex London are not responsible for any lost, stolen, or damaged mail. In the event any of the above were to take place, your package is insured up to $50. A claim will have to be filed with USPS.